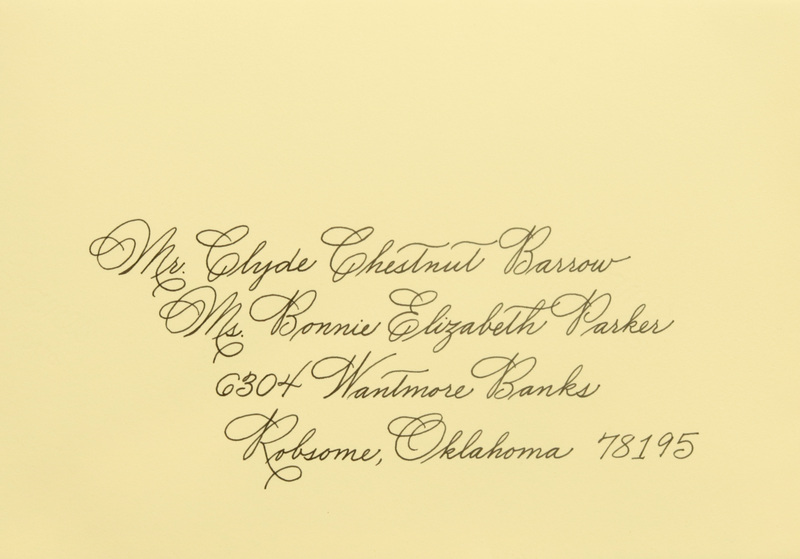 See below for our selection of traditional or “classic” hand calligraphy styles to address your wedding or party invitations with elegance and sophistication! Looking for a custom style? 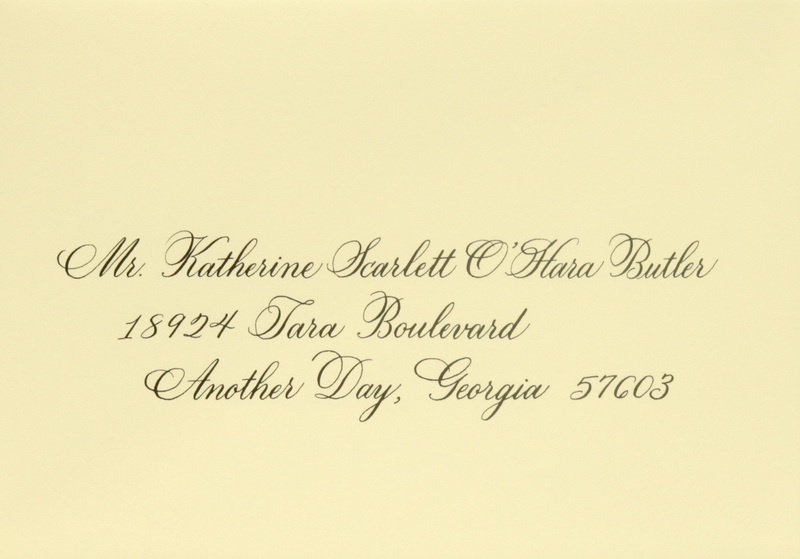 Hand calligraphy can be tailored to your specifications – slant, weight, and spacing can be fashioned to coordinate with your invitation. 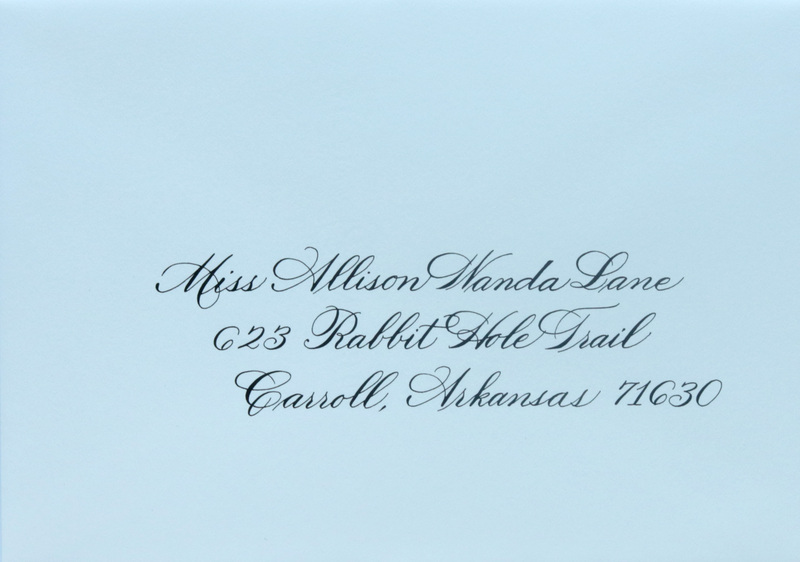 After Maureen reviews a proof of your invitation suite, she can suggest a style that will coordinate with it and create a sample for you to approve before she starts addressing. 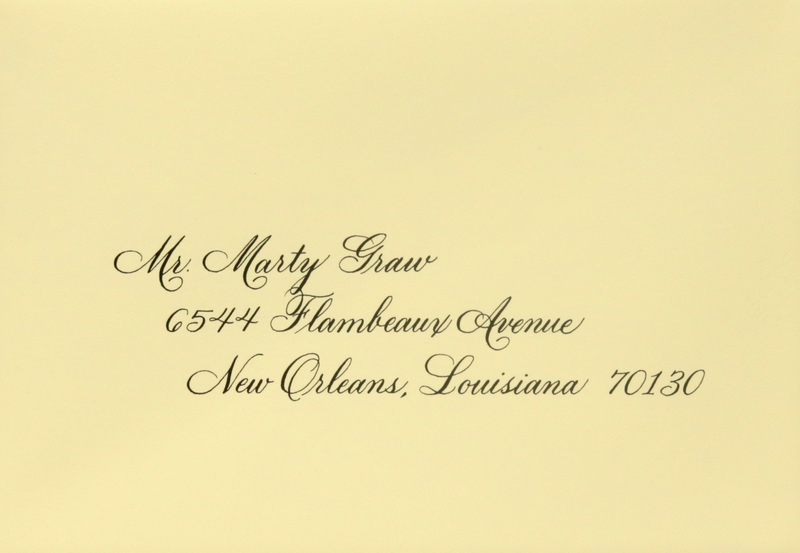 TIP: Scripts with no slant or a slight slant will look more informal than scripts with a greater slant. 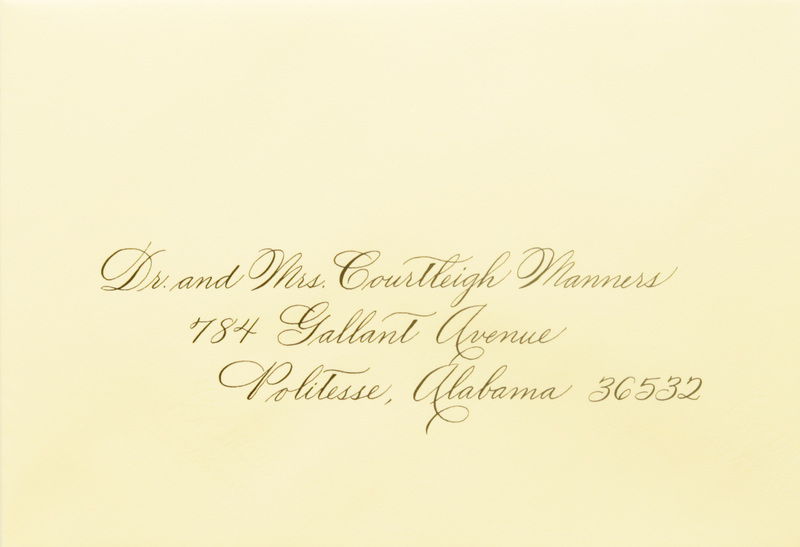 Maureen uses a left-indented style by envelope addressing, where each successive line is indented further to the left. The zip code appears on the same line as the city and state. Looking for a custom layout? 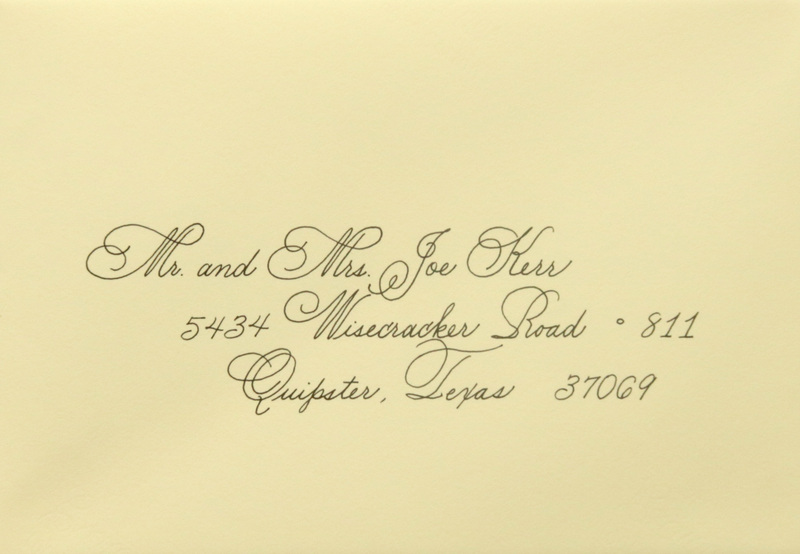 Want the zip code on its own line, the lines centered, or an extra flourish here and there? No worries! Let Maureen know in your instructions when you submit a request for quote! How many extras should you order? 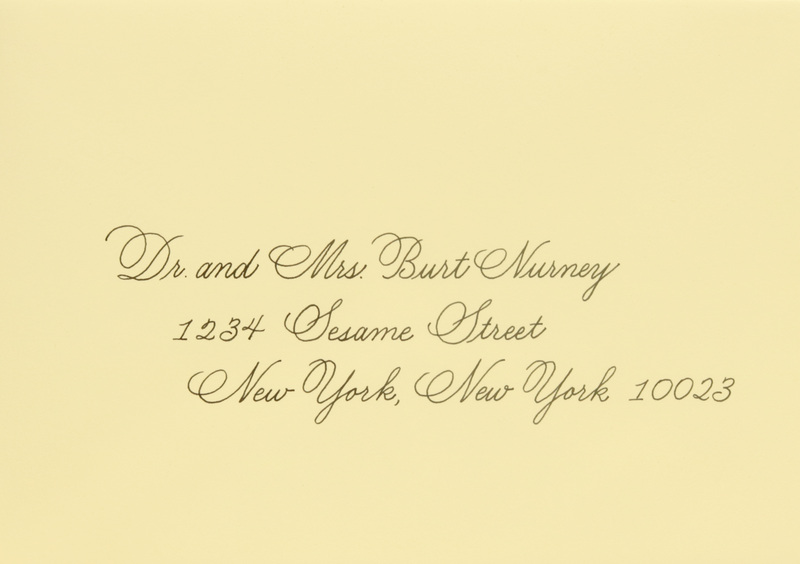 Please provide at least 10% more envelopes than addresses for plain white or ecru envelopes, and 15% or more for other colors or metallic envelopes. 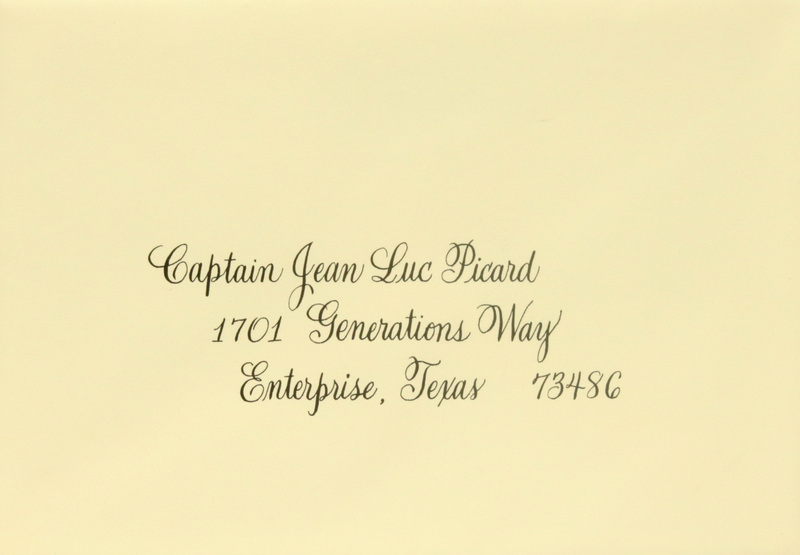 We’ll return any unused blank envelopes. 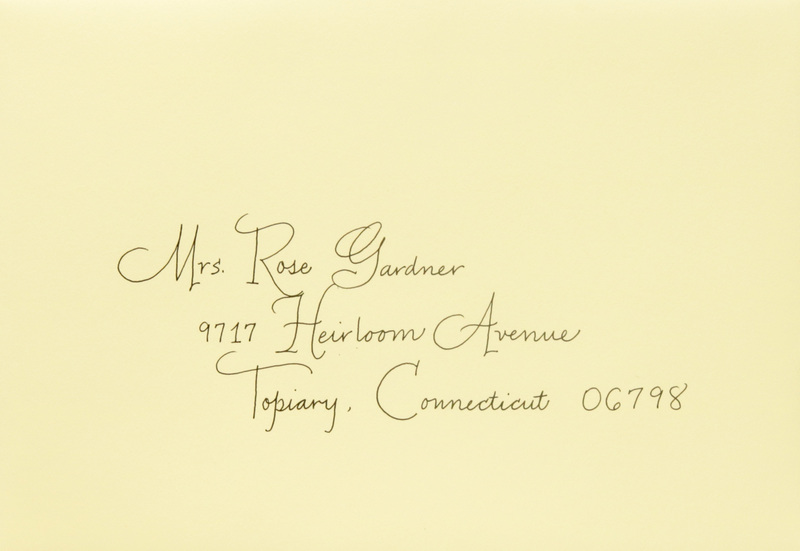 See also Modern Calligraphy Styles. 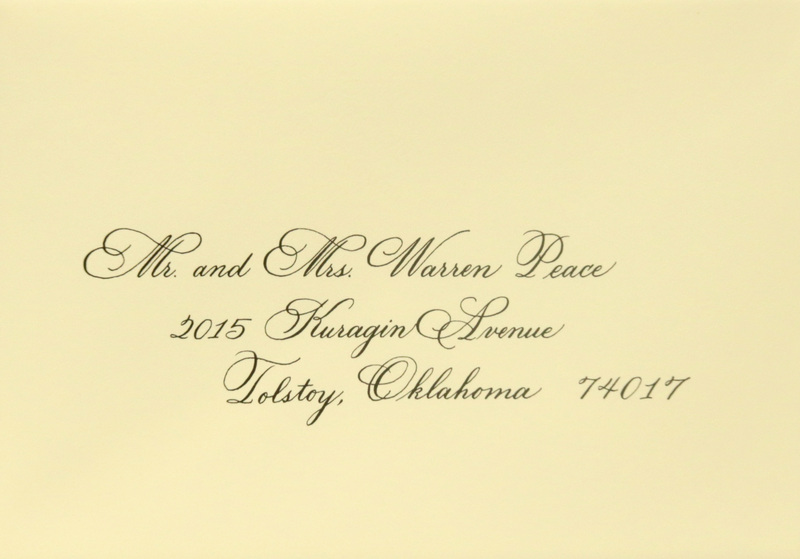 To save on turn-around time, Maureen can hand-letter the guests’ names, then Don can print the addresses in an elegant block font to complement the calligraphy. 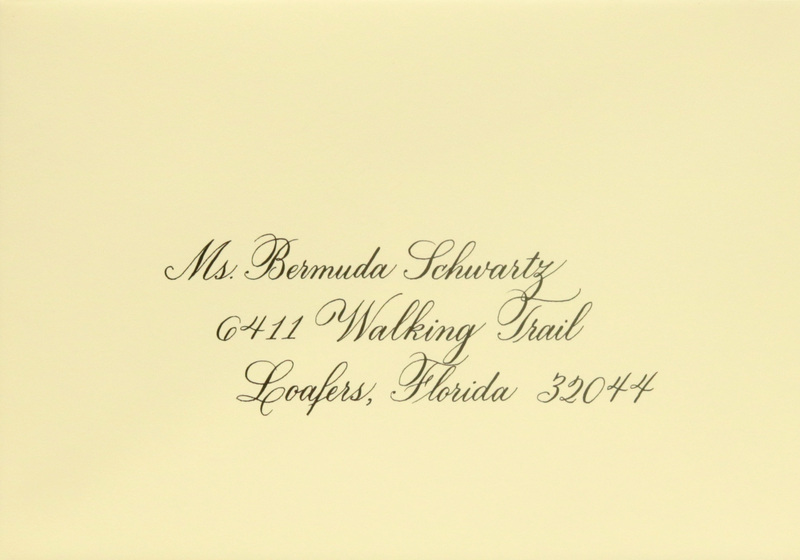 However, this service isn’t available for metallic-coated envelopes since the printer ink sometimes doesn’t play well with coated papers. 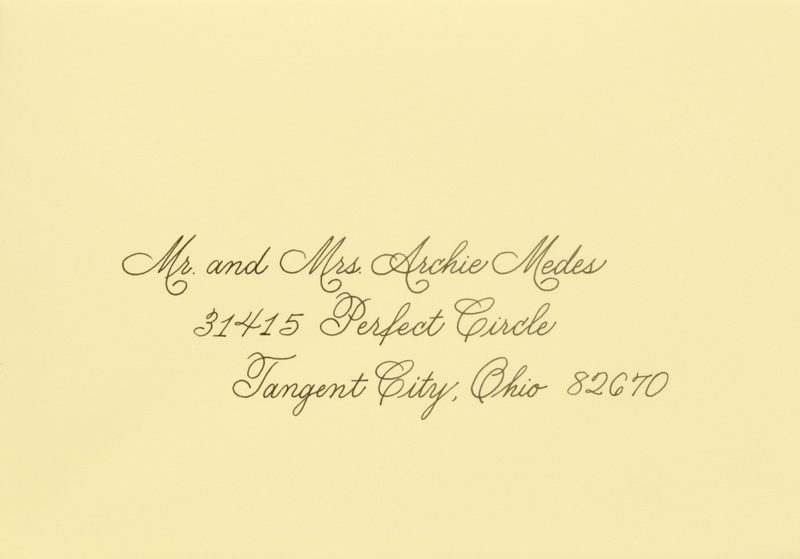 Submit a Request for Quote to ensure availability to address your cards. 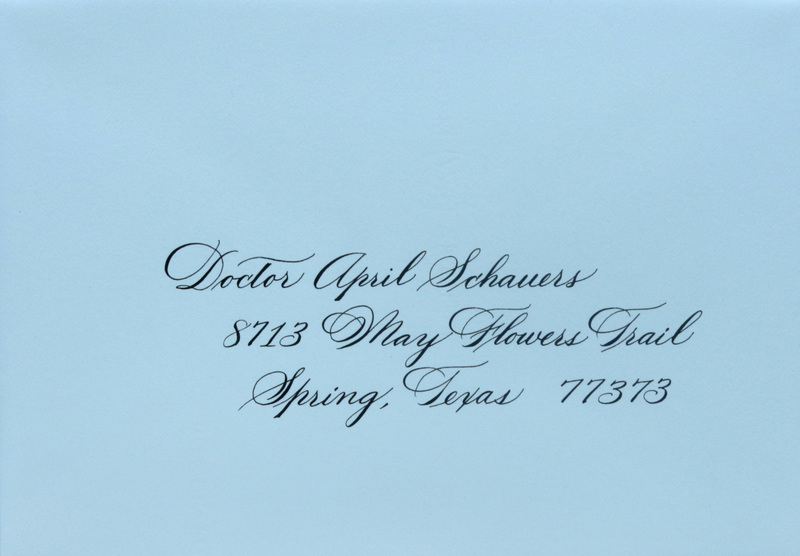 Computer calligraphy services are almost always available, but hand calligraphy may book up weeks in advance. We will confirm our availability after we receive your form. 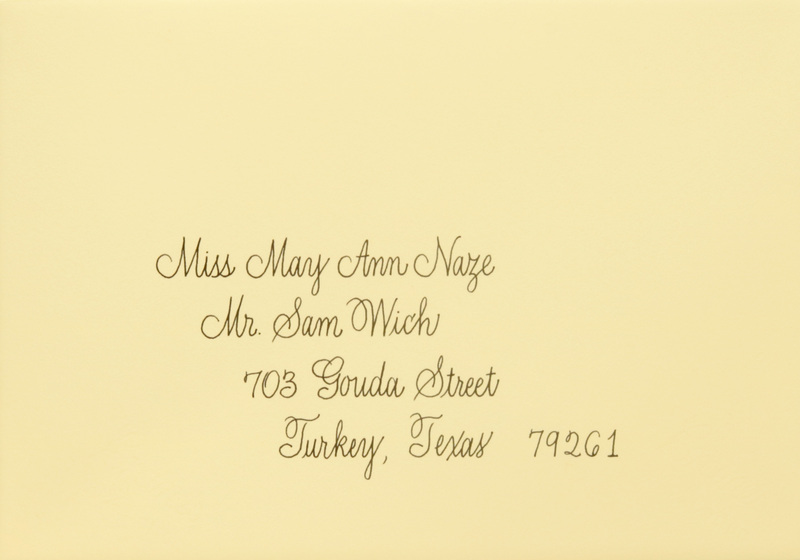 We’ll call or email you when the envelopes are ready for pick up or shipping, along with the balance due. All courier and shipping costs are the responsibility of the client.